Law Enforcement Officers face many dangers daily. And DAILY the left mocks and berates them. It is one of the toughest jobs in the united states. Every day thousands of police officers get up and go to work wondering if today is going to be the day. Are they going to come home and see their family? A routine traffic stop or domestic dispute can turn from a mundane everyday tasks to terror in a matter of seconds. It amazes us how many people think they are going to get away scott free with pointing a loaded firearm at law enforcement officers. It makes you wonder what is going through their heads, Do they really think they are going to win? 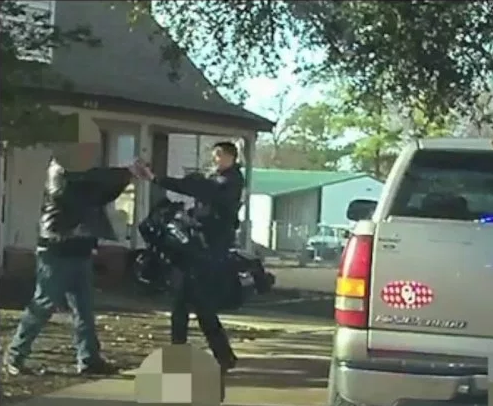 KOCONews writes Authorities on Thursday released body and dash camera videos showing the moment a suspect pulled a gun on a Noble police officer and was then shot. The shooting was reported Dec. 18 during a traffic stop in the 400 block of North Second Street in Noble, according to the Oklahoma State Bureau of Investigation. Police Sgt. Joshua Lesher pulled over 37-year-old Layland Ted Lewis, Jr. Lewis initially gave a false name, but the investigation revealed he was wanted in Cleveland County on suspicion of armed robbery, according to the OSBI. As Lesher tried to properly identify Lewis, Lewis pulled a handgun from his jacket and pointed it at Lesher’s face, officials said.